That magic moment the very first New York City metrosexual marched into a salon and demanded a manicure, the world changed forever. Traditional stoic male behavior has slowly given way to a more narcissistic, epicurean, materialistic, moisturized masculinity. Today, that trend has clearly taken root in the N orth Shore suburbs in big way – and in Mequon, it has evolved into its own unique subspecies: the Mequo-Sexual. Need proof? 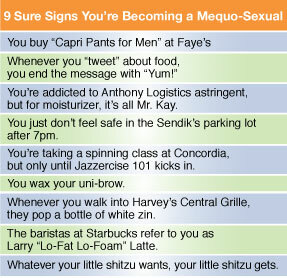 Take a look at the chart below and ask yourself: Do I know someone like that in Mequon?… AM I someone like that in Mequon?